Rodney Rayner - design approach. Rodney Rayner’s jewels are precious, highly individual and very exclusive. Each piece is literally ‘created’, by hand carving in wax, and never simply reproduced from a final design. I like the flexibility to change, alter & perfect the shapes as we create the jewel. I want to check the scale, shape & proportions of each piece to make sure it is both gorgeous and wearable. Many pieces have hidden surprises, so that no matter from which angle a piece is seen, even if only by the wearer, there is something interesting, a surprise of detail, and particularly a warm sense of luxury. To be able to create these pieces we use the very latest techniques combined with the finest traditional skills. Many of our pieces have to be made in multiple parts, where they are then partially set, assembled & only then can the final stones be added and the pieces finished. This results in many hours work in each piece. Many customers wonder at how we managed to set the stones! All my centre stones are specially cut for each individual design, nothing is ‘bought off the shelf’, they are a major part of the overall design, and cut to our own requirements. Most of my jewellery is ‘colour’ and we specialise in creating bold & original pieces. With each new collection we push the boundaries in terms of form, volume and colour. We are a four times winner in the much coveted & prestigious ‘COUTURE Awards’ (the Oscars of the jewellery industry) for ‘Best Design in Colour’ at the COUTURE show in Las Vegas, and an unprecedented ten times nominees. Unlike many brands today, we do not court celebrity. However, we have many high profile clients from film and industry, who trust our style and appreciate our discretion. I started my business when I was 26 years old, and we are now celebrating 33 years in business. I have always been export minded and in my third year in business I made the bold decision to exhibit at the BASEL fair in Switzerland. This year is my 30th continuous year to exhibit at Baselworld. We are constantly evolving our style & creating new designs. We do not follow trends but endeavour to have our own unique look. My clients say they love the fresh inspired feel of each collection and how they can mix and match pieces to create their own unique look. I feel we have survived & flourished in the very competitive international jewellery world only because of our unrelenting insistence on the finest quality & most importantly through being at the forefront of international design. 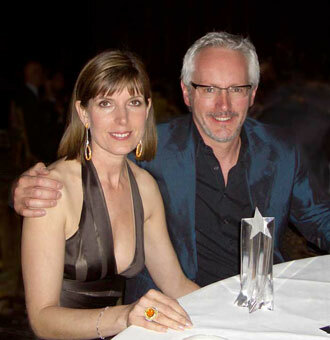 Rodney Rayner’s business partner is his wife Karin. Rodney met Karin whilst exhibiting at the Inhorgenta jewellery show in Munich in 1987. They run the business together, based just outside London, in the county of Surrey, England.